#RoyalWedding! Celebrate with some artsyletters Fun! Click here to see on Etsy! 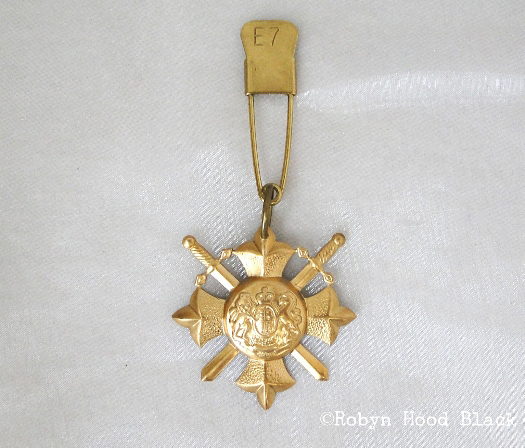 I came across these wonderful vintage brass stampings of the British Royal Coat of Arms (“Royal Arms”) and had to do something with them! I’ve made three of these pins/bag tags. The pin is an antique/vintage brass laundry pin, probably from the 1910s and military, according to vendor. It’s heavy duty. I’ve attached the stamping with a large brass ring from an old clock chain. Cheers! Click to see on Etsy! 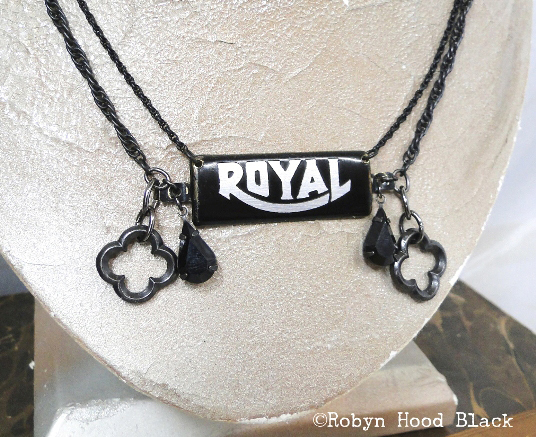 This “Royal” necklace makes a fun statement for typewriter fans. The vintage Royal name plate has been attached to two black rope chains and flanked with vintage black Swarovski crystal drops and fun pewter quatrefoil links. 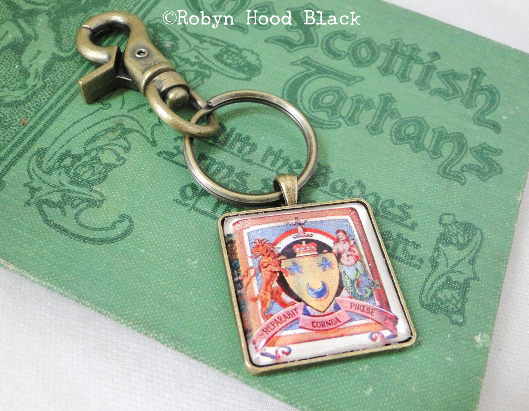 You don’t have to be at the very top of the nobility food chain to enjoy a family crest or coat of arms… I’m making up some Scottish coats of arms keychains/tags for the rest of us, too! This one pictured happens to be for the family name, Scott. The image was clipped from THE SCOTTISH CLANS – With the Badges, Arms, Slogans, etc. of the Clans (Circa 1930). If you’re in the States and rising early like I am to enjoy the festivities (the bride is American, after all! ), here’s a raised cup of Earl Grey to you! And lovely wishes wherever you are in the world.